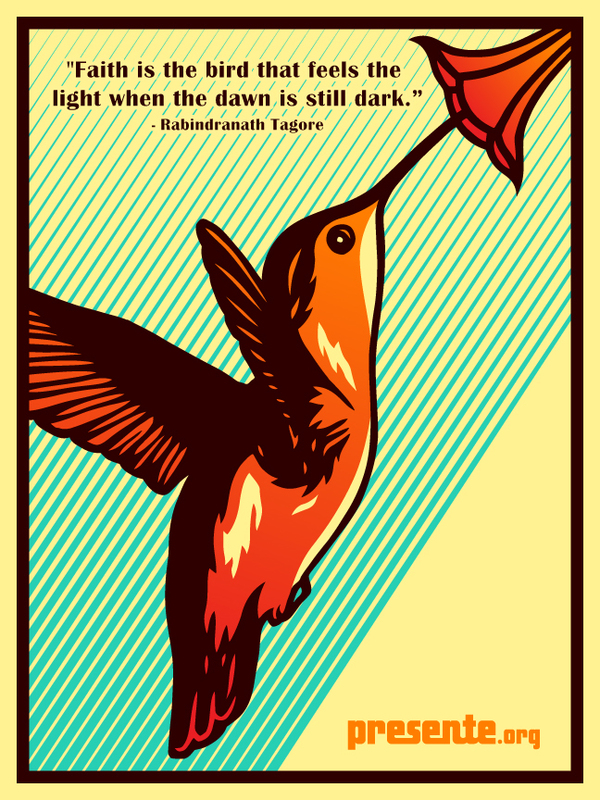 If you donate $5 or more we’ll send you a beautiful hummingbird sticker representing your solidarity with all of our community’s hard work to grow our movement in 2014! President Obama is soon going to pass a big milestone–over 2 MILLION deportations, more than any other U.S. President in history–and politicians in DC are not doing anything to fix this crisis. But we’re not going to wait on anyone. We have big plans for 2014 to force the change that we need. Can you help us be ready for the fights we’ll engage in with a $5 donation to Presente today? As a token of our thanks for your donation of $5 or more, we’ll throw in a sticker featuring a brand new design symbolizing our resilient spirit. If you donate $30 or more you’ll get the sticker PLUS a DVD of Harvest of Empire, a powerful documentary on the Latin American immigrant experience. Hummingbirds are one of the hardest working creatures in nature. They work intensely to find enough resources to survive, as they need to replenish their energy to renew themselves and raise a new generation. Just like the hummingbird, the Presente community is working hard, cross-pollinating with our allies and readying for battle in 2014. We were the first organization to oppose S. 744, the Senate bill that would have further militarized the border in unprecedented ways. We pushed the debate in a pro-migrant direction to expose how the Senate bill excluded large sections of the immigrant community. We successfully stopped Disney’s efforts to copyright the Dia de los Muertos tradition and appropriate Latino culture. We protected California Latinos’ access to rooftop solar energy by fighting powerful energy companies who targeted the California Latino Caucus and by forcing changes in AB 327. We still have critical fights ahead of us and like the hummingbird, we need to rise to the challenges we will face. But without your support, we will simply not be able to succeed. Will you chip in $5.00 or more to help Presente stay in these fights? Immigrant rights – we will ramp up our efforts to hold President Obama accountable for his record on separating our families and work to stop the deportations. Criminal justice – we will fight state and federal policies that enrich the prison-industrial complex by disproportionately detaining and imprisoning Latinos. Environmental justice – we will build on 2013’s successes to fight anti-clean energy forces in the southwest. We’re committed to holding politicians who are in bed with utility companies and dirty energy interests accountable for polluting our neighborhoods. We’re only getting started. But our strength relies on your support. Will you donate $5 today to Presente? And if you donate $15 or more, we will send you a couple of our newly designed stickers to thank you for your solidarity with our movement.